Humpty Dumpty Institute : Congressional Delegations, 21st Delegation to the U.N. 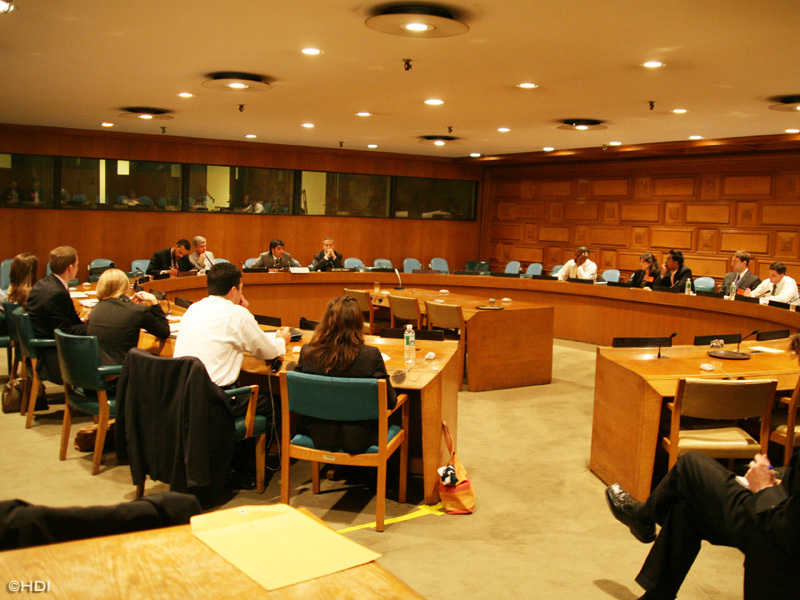 The Humpty Dumpty Institute, sponsored its 21st Congressional Staff Delegation to the United Nations Headquarters on Thursday, April 26th, and Friday, April 27th, 2007. The bipartisan delegation, comprised of fifteen staff members from the United States Senate Committee on Foreign Relations, was briefed on U.N. activities in Iraq, Afghanistan, Kosovo and Darfur as well as on U.N. Reform, U.N. Peacekeeping, and the new U.N. Human Rights Council. The Congressional Staffers had the opportunity to attend presentations by Ambassador Alejandro Wolff, the Deputy Permanent Representative at the United States Mission to the United Nations, Mr. Salman Ahmed, Special Assistant to the Under-Secretary-General for Peacekeeping, Ambassador B. Lynn Pascoe, Under-Secretary-General for Policy Planning, and Dr. Robert C. Orr, Assistant Secretary-General for Political Affairs. 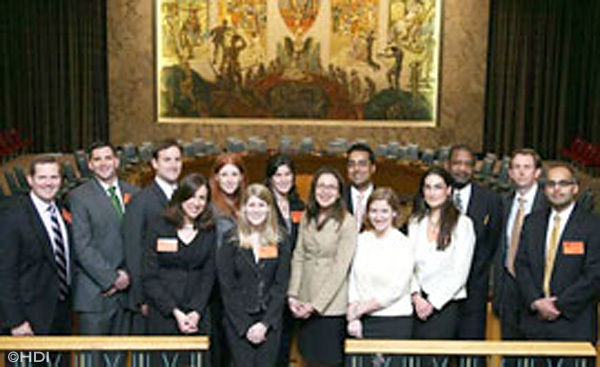 The Humpty Dumpty Institute sponsored its 21st Congressional Staff Delegation to the United Nations on Thursday, April 26th, and Friday, April 27th, 2007. HDI's program served as an opportunity for Congressional Aids who work on U.N. issues within the context of their jobs to ask specific questions to high level U.N. and U.S. United Nations mission officials. With this 21st delegation, HDI has now brought more than 340 congressional offices to United Nations Headquarters. Working through the U.S. Mission and the U.N. Secretariat, The Humpty Dumpty Institute organized an impressive collection of senior U.S. and U.N. officials to provide unfettered access to congressional participants. Congressional staff had the opportunity to discuss such red-button issues as the situations in Iraq, Afghanistan, Kosovo and Darfur, U.N. Reform, U.N. Peacekeeping, United Nations Commission on Human Rights, and U.S. relations with China and Russia. Mr. Alejandro Wolff, Deputy Permanent Representative, United States Mission to the United Nations thanked the congressional staff delegation for coming to the UN. Mr. Wolff shared with congressmen and congresswomen his views on the appointment of Ban Ki-Moon of South Korea as the new Secretary General of the United Nations. Mr. Wolff believes that Ban-Ki-Moon is a reformer and that he will do all in his power to make U.N. more transparent and efficient. He also talked about granting independence to Kosovo, and about ways to convince Serbia and Russia that this is the best outcome given the severity of the situation. Mr. Wolff also talked about the situation in Darfur and the necessity of a political process there to make United Nations Peacekeepers deployment possible. He also spoke about the role of China in World Affairs. Mr. Salman Ahmed, Special Assistant to the Under-Secretary-General for Peacekeeping spoke about challenges that the U.N. peacekeeping force faces around the world. Mr. Ahmed pointed out that United Nations has the second largest standing army in the world after the United States in terms of man power, but their budget is just a small percentage of what the United States spends. 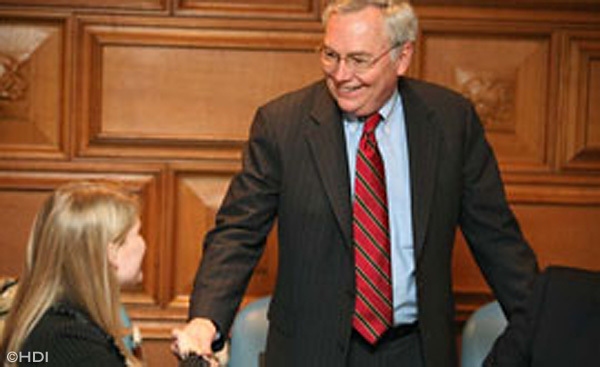 He also spoke about the importance of troop donor states to the U.N. peacekeeping operations. He wanted to point out that Asia provides the majority of U.N. troops, especially India and Pakistan, while Japan underwrites many of the operations financially. He believes Asia is so active because they don't have regional institutions on the like of the African Union and NATO. Therefore, they give more support to the global institutions, such as the United Nations. Mr. Ahmed, answering to a question posed by one of the program participants made it clear that there will be no U.N. force in Darfur without Khartoum's permission. The participants also received a briefing on Darfur from Michael Gaouette, the Political Affairs Officer working on Sudan. Ambassador B. Lynn Pascoe, Under-Secretary-General for Policy Planning spoke about his experience as an American in the U.S. secretariat. He spoke about misperceptions and stereotypes that many Americans have about the United Nations. He made a clear distinction between U.N. Secretariat and staff from the member-countries, saying that the U.N. secretariat really cares about improving the world, and they have so much work on their shoulders that they have no time for politics at all. Dr. Robert C. Orr, Assistant Secretary-General for Political Affairs told the program participants that their visit was crucial to improving the image of the Unites States at the United Nations. Mr. Orr thanked them for coming and stressed the importance of paying off all arrears owed by the United States, which will make other countries more open to the point of view of the United States. He also advised that the United States not to cut funding from the Human Rights Commission. In fact, U.S. should play a larger role in reforming the Human Rights Commission instead of abandoning it to the worst regimes. He noted that countries recently elected to the commission have a better human rights record than the ones that served on the commission last year. H.E. Hamid Al Bayati, Ambassador Extraordinary and Plenipotentiary, Permanent Representative of Iraq to the U.N. discussed the current situation in Iraq and the role U.N. plays in putting the country back on its feet. He said that Iraqis have never had any ethnic tensions before Saddam came to power. Ambassador Al Bayati made it clear that Saddamists and Al-Qaeda are trying to stir ethnic tensions or even to start the civil war in Iraq. They don't discriminate between Kurds, Shias and Sunnis as their victims are people from all ethnic groups. He also said that the rumor in the U.S.A. that women had more rights during Saddam's era than now is simply not true. Before, women were forced to join the Bath party if they wanted to find an employment. This has changed since the liberation. Women now have a sizable presence in Parliament, and they are free to pursue their dreams. 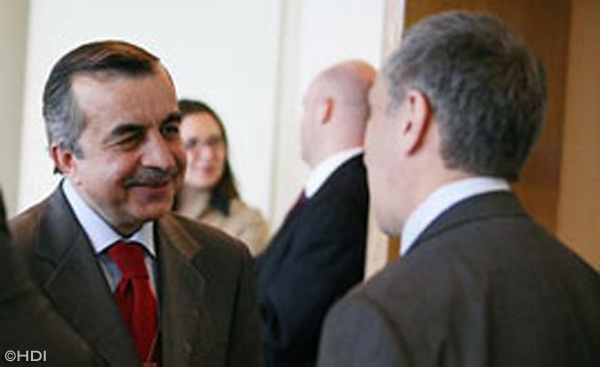 Ambassador Al Bayati also thanked the United States for its support of Iraq. H.E. Zahir Tanin, Ambassador Extraordinary and Plenipotentiary, Permanent Representative of Afghanistan to the U.N also discussed the current situation in Iraq. He stressed the importance of U.N. as bringing legitimacy to the large international presence in Iraq. Ambassador Tanin also spoke about the role U.N. plays in rebuilding Afghanistan. He stressed the important part U.N. played in convening Loya Jirga, creating Afghani Constitution, and assisting with the elections. Ambassador Tanin spoke about how the situation changed to the better in Afghanistan with school rebuilding, refugees returning, and women returning to the public sphere of the state after Taliban's demise. In fact 25 percent of the Afghani Parliamentarians are women. Ambassador Tanin also thanked Americans for its commitment and sacrifice in Afghanistan. Mr. David Kaatrud, Director, Coordinator and Response Division, Office for the Coordination of Humanitarian Affairs spoke about the refugee crisis in Iraq, and how it affects neighboring states such as Jordan and Syria. He spoke about efforts of the United Nations to keep the situation under control. He also pointed out that the only humanitarian organization with a country-wide access in Iraq at the present time is the Iraqi Red Cross. Mr. Kaatrud reminded everyone why the U.N. Humanitarian Arm decreased its presence in Iraq, mentioning the bombing of the U.N. headquarters in Iraq resulting in the death of 22 U.N. staffers, including U.N. envoy Sergio Vieira de Mello. Mr. Kaatrud said that security in Iraq is crucial for OCHA to be able to do its humanitarian work in Iraq. Mr. Ian Sinclair, U.N. Department of Peacekeeping Operations (DPKO) participated in the working lunch to answer any questions the program participants had.